It's JUGHEAD versus ALL OF RIVERDALE in a race to the finish! A "video game go-kart race to the finish," that is. BUT IT'S STILL EXCITING. 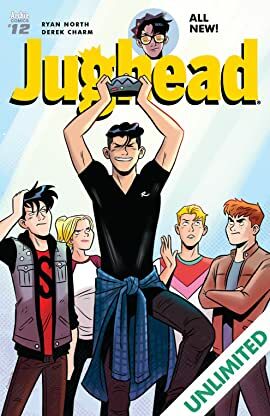 When Reggie convinces everyone to bet that the winner will be King For A Day and everyone has to do what he says, what could possibly go wrong? Well, "Reggie then winning that bet and being in charge of everyone" springs immediately to mind. SPOILER ALERT: THAT IS TOTALLY A THING THAT HAPPENS! This start of a new arc features the following: Pals! Conflict! And making mistakes on the internet which no one NEVER EVER FORGETS! !